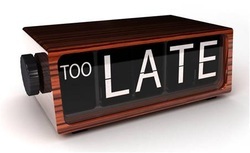 Are you having a hard time motivating students to be on time? You are not alone. February and March are often the hardest months with tardiness. 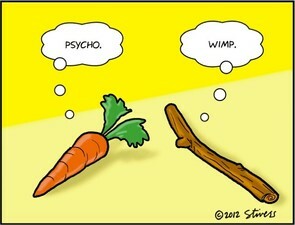 Here are Carrots (incentives) and Sticks (penalties) that can help you help your class be on time better. There is also some good general advice, and what the policy manual has to say on the matter. I am sure that if you read through the list, you will come away with a few things to try, which will help your class do better. I think the goal of all of us teachers is to teach “Life Changing” lessons. But how can a lesson be life changing unless it motivates a student to “change”. All the techniques, activities, scriptures, and skills really come down to the one or two life changing principles or doctrines you hope sunk in, that they take away from class. Everything else we do is window-dressing. Years ago when I was teaching Seminary, I had a great Principal who, when the students were leaving my class, would take a student by the arm and say, “Hey, what did you learn in there today?” Being in earshot I would pray the student would say one of those life changing principles, and that it sunk in. That is the "TakeAway". That is what it is all about. Try it with your students. After a lesson, hold up the graphic and say, “Complete the sentences based on today’s lesson.” If they can do it, you know the lesson just might have sunk into their hearts, and will change a life. For some teachers, “glue-ins” are a new idea that need to be explained. So let me try. 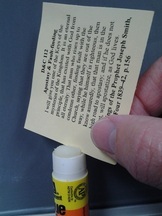 Glue-ins are small handouts that students can glue into their scriptures in a special way. To do this, they will need the small paper glue in (already cut for them) and a glue stick. Have them open the glue stick and then have them pretend they are giving the glue stick a paper cut by taking the left edge (only) of the paper, and dragging it through the glue stick. This should only put a very slight amount of glue on the paper's edge. Then they should open their scriptures to the place the glue-in refers to. 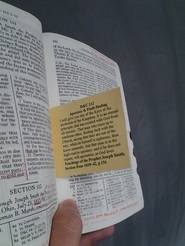 There they place that sticky side into the binding of their scriptures and then shut the book. Then when they open to that page in the future, not only will they see their scriptures, but also the glue-in sticking out for them to refer to. Sweet. 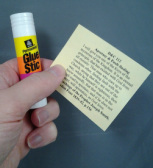 Naturally, there will be students who would rather just keep it as a small handout rather than glue it in their scriptures. Some like to glue it into their journals, although I am not sure why. I have changed the Weekly Attendance Word document. Once you have your class list, simply open the Word document and type in your students’ names. Then each week print a new one off. Teachers usually just put this sheet by the door and student’s write the time they arrived in the one spot, and if they read (including the weekends) in the other spot. That way, at the end of the week you can easily enter your attendance in WISE. It also helps you to be encouraging students. The sheet also keeps track of how students are doing with daily scripture study. Okay, the honeymoon is probably over in your seminary class. You might be seeing some negative behaviors starting to crop up, and you’re not entirely sure what to do about it. 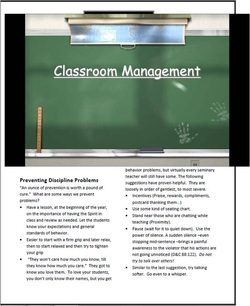 The handout here (click on the picture) is a list of things you might try and do as you strive to overcome some discipline problems that might be coming up around now. There isn’t one technique or strategies that will work with every student, every time. But I put together the list to help study out how to resolve the situation. I’m sure there will be some ideas that you perhaps haven’t thought of before. Also, don’t wait to let your coordinator know about the situation. I am sure with his experience, he will have a bag of tricks and techniques to help you as he sees the situation first hand. The third page of the handout is a behavior contract that I have used in the past. This is for when a student’s behavior is keeping others from feeling the Spirit in class. If you have tried everything else, and there is no resolution, then it is better that a student loses their privilege to take seminary, than everyone else being prevented from feeling the Spirit. In the long run, it will also be better for the student. This contract is worded in such a way that they can see the true purpose behind the contract. 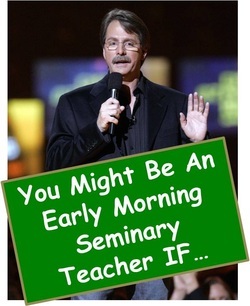 "You Might Be An Early Morning Seminary Teacher If..."
I wanted to share with you something wonderful that an early morning seminary teacher shared with me. Thank you LeAnne R. for sharing! And may the Lord bless and help each of us as we strive to bless the lives of these precious youth. As teachers, we are always trying to make our jobs obsolete. What I mean is, we want to get our students so good at digging into the scriptures and finding gems, that they don’t need us to help them find those treasures in the scriptures. In other words, we want to teach them how to fish rather than just handing them fish we caught in the scriptures. On the S&I website is a wonderful set of videos of real classes where teachers are doing this training. One is a video of Sister Morgan’s class. In it she shares some powerful quotes with her class and also teaches them “Power Phrases”. Click on the image to download the “Power Phrases” and a bunch of other wonderful quotes by the Brethren concerning scripture study skills. CAUTION: Don’t overwhelm your class by sharing a bunch of quotes all on the same day. It is probably best to just show one quote on a given day, and then have your kids try modeling that with a set of verses. CLICK HERE to go to the link to Sister Morgan’s class or go into the S&I website and click on the tab “Improve Teaching” then, “Inservice Library” then, “Teaching and Learning Emphasis”. There will be a bunch of wonderful examples of training our students how become proficient in scripture study skills. 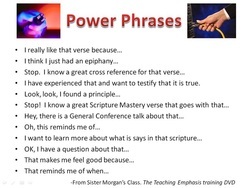 Sister Morgan does a great job of sharing one of these quotes and them having the students dig into the scriptures trying to model what was taught in the quote and then sharing. She also used the “Power Phrases”. The following are two items I shared last year. Click on the picture to download the instructions for the Spin the Dreidel Scripture Mastery game. This being December, we are approaching the Hanukkah season which has its ties to the Old and New Testament. Your class has learned how the Tabernacle, and other ancient temples, had a large candlestick Menorah which was to be constantly burning in the temple (Exodus 25:31-37). In the 400 years between the Old and New Testament, there was a battle which caused there only to be a one day supply of oil for the lamps. But a miracle occurred in which the one day’s worth of oil lasted for 8 days until more oil could be secured. In the New Testament this festival is mentioned briefly in John 10:22 and today Jews all over the world celebrate Hanukkah. Hanukkah this year (2012) starts on sundown December 8, and ends December 16th. 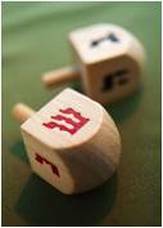 Traditionally during Hanukkah, after the Menorah is lit, it is customary in many homes to play the Dreidel game. This is a Scripture Mastery game based loosely off of the rules of the dreidel game. You can often find this inexpensive toy in many stores in their holiday sections. You can also call your local synagogue and they can direct you were to find a dreidel top. Have fun spinning the dreidel! 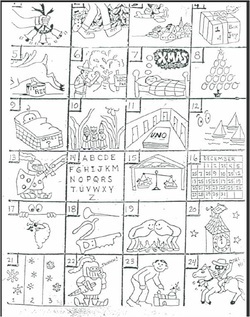 The worksheet here is just some fun Christmas activities and trivia. The answers are on the last pages. Click on the image. I’ll be taking the rest of the month off from posting, and be back to sharing in January. The Lord be with each of you, in all you do. Here is a Christmas gift craft you can do in class. 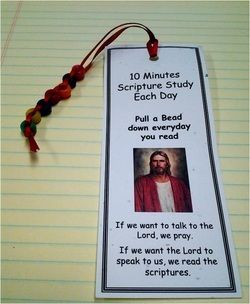 It stresses and helps your students get in the habit of daily scripture study. Before class you will need to print off the bookmarks on cardstock. Then get ribbon, a bunch of beads, and hole punch protectors. You probably will want to get some things done before class like cutting the ribbon in 16-17 inch strips. Have your class do the rest. Click on the picture to download the instructions and bookmarks. Have fun together, and listen to some Christmas music. Also, make sure they understand that each day they read, they pull a bead down so by the end of the week, they will have pulled 7 beads down. Urge them to make it a goal to read each day. Part of our charge as seminary teachers is to teach the words of the living Prophets. And there is no better time for this then General Conference. Because of our charge to teach the living Prophets, I’ve always given one day of makeup work for every hour they watch (and at least one page of notes for that hour). So all of our students would be able to make up 10 days (or hours) of makeup work in a short period of time. I let young ladies also count watching a notes for the Relief Societ Broadcast or YW Broadcast. The handout HERE is simply the pictures of all 15 living prophets. Your students should learn to recognize them by sight (in case they run into them on vacation) so this is a fill in the blank for their names. This is fun to do before Conference, and then quiz them again after conference. You can use an overhead projector for this too. 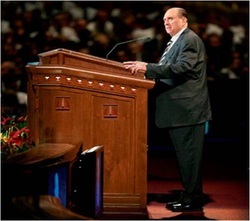 The last handout HERE is a list of interesting facts about all 15 living prophets. This may be best to use before conference to get them excited to watch. Thank you Brother McArthur for sharing some of these! The next time you have seminary after Conference, and before they turn in their notes, have them share what they liked. If you give them prompts, they will have a lot to share. Those are great seminary lessons. Maybe see who watched the most hours and have a surprise for them. Games & Incentives to help them be "ON TIME!" Expect that it will take a few days to get this going. And make sure you only give the clues to those one time. 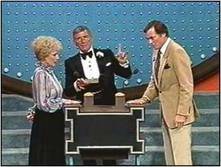 Only one prize per week and not answers till Friday. Thanks Sister Sykes for sharing this idea! For a handout with many more helps, games. and ideas to reduce tardies, use the document below.